Save $1,800 per couple on certain cabin categories of this river cruise when you book and pay in full. Click here for eligible departures. As history plays such a large part of your river cruise experience, spend some time with our onboard Riverlorian to gain insight into our nation's history and heritage. 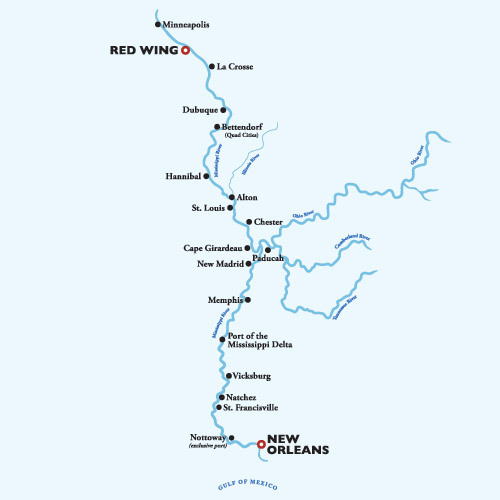 Relive a tale from Mark Twain or simply enjoy the fascinating stories, facts and fables of the very stretch of river on which you are cruising. For a remarkable one-of-a-kind experience, take a guided tour of the American Queen's Engine Room to explore the inner workings of our classic, steam-powered vessel or take in a guided tour of the Pilot House where you can witness the latest high-tech electronics that help us navigate our innovative paddlewheeler up the changing currents of Old Man River in modern-day America. Relax on deck with a copy of Huckleberry Finn or another imaginative selection borrowed from our revered Mark Twain Gallery, enjoy some quiet time in the Ladies' Tea Parlor, or recruit your fellow guests for an exciting board game in our Gentelmen's Card Room.